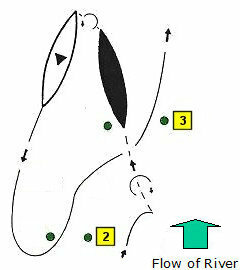 The competitor passes through the gate in the wrong direction - with or without a touch. 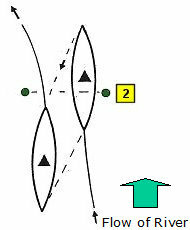 The first and last passes through the gate must be in the correct direction. 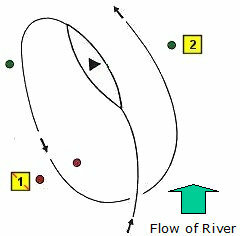 In the example below, a paddler breaks out above the gate, reverses through it and then paddles out in the right direction. It's a 50, and it cannot be undone. It's also a 50 if the paddler negotiates the gate in the correct direction, but then drops back through it and paddles away. 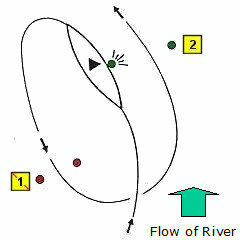 It is not a penalty if there is a movement in the wrong direction, provided that the paddler is going in the right direction at the start and finish of negotiation. So a wash back, a bounce off a rock or the wind moving the gate back and forward during passage do not count as fifties. "Not the Whole Head" or "Half Head"
The whole of the paddler's head does not pass through the gate line. 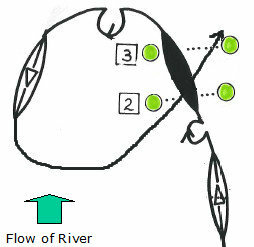 If a paddler or C2 crew would have incurred a 50 penalty by "not the whole head" the paddler/crew can return, make a second attempt at the gate and "clear" the 50, provided that they did not pass through the gate line in the wrong direction and they have not touched or negotiated a following gate. But if there was a touch on any pass, the touch penalty stands. 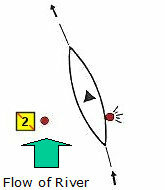 In the case of a C2, the boat leaves the gate line without both paddlers' heads passing through. 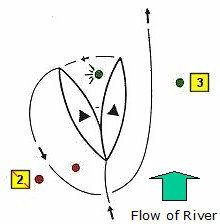 If a C2 crew would have incurred a 50 penalty because only one of the two paddlers has passed through the gate ("split gate"), the paddler/crew can return, make a second attempt at the gate and "clear" the 50 provided that they did not pass through the gate line in the wrong direction and they have not touched or negotiated a following gate. Both paddlers' heads must pass through the gate in the new attempt, not just the one who didn't before! If there was a touch on any pass, the touch penalty stands. There is no part of the boat in the gate when the paddler's head passes through. If a paddler or C2 crew would have incurred a 50 penalty by "no boat" the paddler/crew can return, make a second attempt at the gate and "clear" the 50 provided that they did not pass through the gate line in the wrong direction and they have not touched or negotiated a following gate. The boat is upside-down in the gate line. 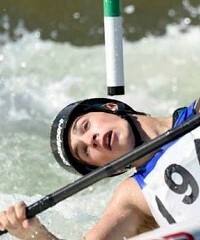 Note: it is not considered "upside down" if any part of the paddler's head is above the water. 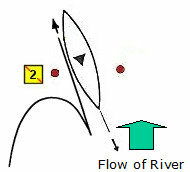 If a paddler or C2 crew would have incurred a 50 penalty by being capsized through the gate line, the paddler/crew can return, make a second attempt at the gate and "clear" the 50 provided that they did not pass through the gate line in the wrong direction and they have not touched or negotiated a following gate. 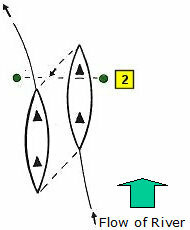 If the capsized boat passed through two gates, the second attempt clears the second gate (here, Gate 3) but not Gate 2, because passing through Gate 3, even capsized, counts as starting negotiation of Gate 3 and "kills" Gate 2 (see Prenegotiation). 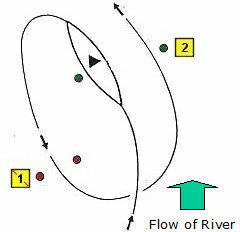 Negotiation of a gate starts when the paddler's head enters the gate line or any part of the body, boat or equipment touches it. Once a paddler "starts negotiation" of any gate, all previous gates are "dead", and if any previous gate has not yet been negotiated a 50-second penalty applies - even if the paddler afterwards negotiates it. No Buts. This one cannot be undone. 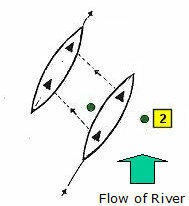 In this second diagram the paddler crosses a wide Gate 2 gate line and turns back across the line to negotiate Gate 1. Either way, Gate 1 is "dead" before the paddler negotiates it, so a 50 is incurred. But there is no penalty on Gate 2 because negotiation started and finished in the correct direction. 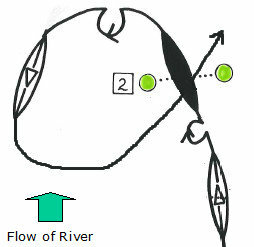 Even if the boat is upside-down when it passes through a gate, it counts as a negotiation. Here the boat passes though Gate 3 upside-down (represented by the black boat) then rolls up. Gate 2 is "dead" before the paddler negotiates it. The later correct negotiation of gate 3 "clears" that penalty, but the 50 on gate 2 stands. The later correct negotiation of Gate 3 "clears" the "capsized in gate" penalty, but the 50 on gate 2 stands. 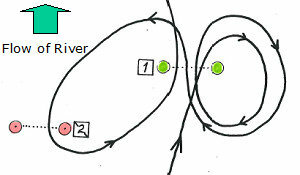 A touch starts negotiation, and once a paddler "starts negotiation" of a gate, all previous gates are "dead". If any previous gate has not yet been negotiated a 50-second penalty applies - even if the paddler afterwards negotiates it. Here the boat touches the outside of the right pole of Gate 2 before negotiating Gate 1. 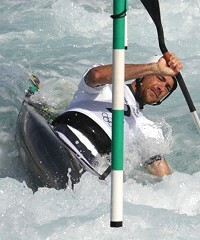 Although the paddler goes on to negotiate Gate 1 it is already "dead". It's a 50 on Gate 1, and a 2 on Gate 2 for the touch. Don't overlook the touch penalty from the first approach to Gate 2! 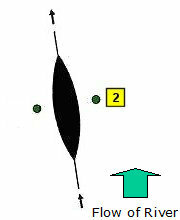 Here the nose of the boat enters Gate 3 and, in turning away, touches the tip of the pole with the foredeck. It's a 50 on Gate 2, and a 2 on Gate 3 for the touch. If the front of the boat had passed under the Gate 3 pole without touching, there would be no penalty on either gate. Here the paddler touches Gate 3. Gate 2 is now "dead", so the outside touch doesn't matter. There is no additional penalty for the touch on Gate 2, or for not negotiating it. But it's a 50 on Gate 2, and a 2 on Gate 3 for the touch. There is no penalty for repeating a gate. 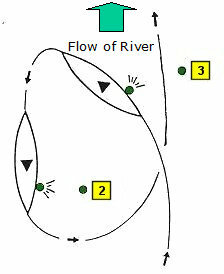 In this diagram the paddler does Gate 1 three times, then does Gate 2, and then goes through Gate 1 again. There's no penalty. You can do a gate as many times as you like, as long as it's in the right direction - but the gate is "live" until you start negotiation of the following gate, and any touch, on any pass, will count. Once your head enters Gate 2, or you touch it, Gate 1 is "dead" and going through it - even in the wrong direction, or even touching it - isn't a penalty. 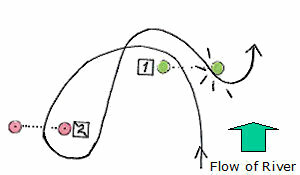 If, after doing Gate 2, the paddler goes through Gate 1 in the wrong direction, and/or with a touch, there is no penalty because the gate is "dead".